KEYCOM develops versatile measurement systems for the magnetic substance characteristics of ESR (electron spin resonance) measurement and the measurement of permeability by S parameter method, etc. 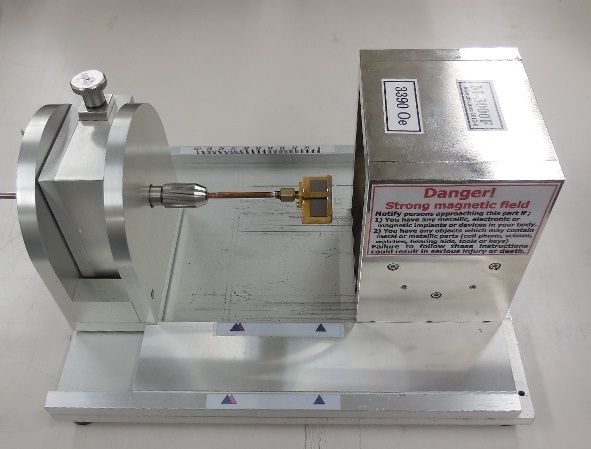 KEYCOM’s magnetic property characteristics measurement system delivers ideal measurement solutions for complex permeability μr'- jμr'', ferromagnetic resonance relaxation coefficient α, resonant line width ΔH, and saturation magnetization 4πMs in wideband from 100kHz up to 25GHz (30GHz). Please also refer to the webpage of KEYCOM's measurements, evaluations and analyses service center. This system is for the magnetic materials, especially the best for the research such as Spintoronics and Quantum dots technology. ･ It has the measurement sensitivity more than that of standard type X band ESR system, because it uses ferromagnetic resonance(FMR) . ･ You can rotate the specimen by two axis accurately, and can incline the specimen. ･ You can change the static magnetic field from zero to high magnetic field up to 500 mT. KEYCOM provides S-parameter method measurement systems in two modes, the reflection mode and the transmission mode, to address the individual purposes. Both modes measure the complex permittivity (εr) and complex permeability (μr) at the same time, and the proper usage is as follows. Practical data can be obtained even when the specimen is placed on a rough, uneven surface. It is compact and allows specimens to be measured by flat-wave because of the direct installment of lens with an antenna. It performs measurements by monitoring the S11 parameter via connections of a test fixture to a vector network analyzer and a PC. It can be measured the dependency on angle of incidence of the magnitude and phase of the reflection coefficient in both the TE wave and the TM wave. Complex relative permittivity and complex permeability are estimated from these measured values. Unlike the coaxial-tube-type or a waveguide-type methods, this method does not involve errors caused by air-gaps since the specimens are not installed in a fixture. The lens attached to antenna enables to measure samples with plane wave, resulting in the high measurement accuracy. This method using a parallel beam from a antenna can reduce the size of a specimen. Vector network analyzer is not required, as it is a scalar measurement. Dielectric constant compared with source and permeability compared with source can be measured the difference between TE TM wave of the reflection coefficient and amplitude ratio of the wave and phase. Unlike coaxial tube or waveguide, and the error by the airgap doesn't occur as it doesn't put the sample in Ficscha. It is compact size installing a lens to an antenna. You can measure a sample by plane wave. As the sample can be set close to the antenna, the sample will be small in size, you can read εr' and μr at frequency.